Check out our page on how to build a pulsed RF source! The first measurement we will add to this page is recovery time. 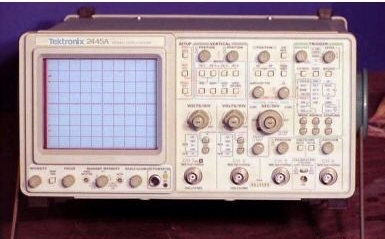 Let us say first, that there is no better oscilloscope than a Tektronix oscilloscope. It's not just us, there are people out there that collect old Tek scopes as a hobby! We don't have the resources to do justice to the history of oscilloscopes, but here some people over on wikipedia have made an attempt... check it out! Oscilloscope measurements are to the time domain what spectrum analysis measurements are to the frequency domain. Most microwave oscilloscope measurements require you to use some type of envelop detector circuit, since microwave frequencies are high compared to the bandwidth of typical oscilloscopes. However, modern digitizing scopes can record and display waveforms as high as millimeterwave frequencies. This is a very recent development, if you asked the Unknown Editor twenty years ago if he would ever be able to go into the lab and display an X-band sine wave on an o-scope, he'd have asked you what you were smoking! As signal frequency increases, the capability of the oscilloscope to accurately display the signal decreases. Yes this page needs work, help a brother out and send us some material! In pulsed systems it is often important to determine how sharp the transition from "RF on" to "RF off" is. This is measured using a detector and an oscilloscope, and a pulsed RF source. We have a new chapter on building a pulsed RF source, check it out! An RF detector is merely some type of diode that rectifies RF incident on one port and outputs a DC signal on the opposite port, Typical detectors use Schottky diodes or tunnel diodes. Check out our separate page on detectors! This measurement is typically done on a receiver in a radar system, or bits of a receiver such as the front-end limiter and/or low noise amplifier. By the way, we've searched the world-wide web for a description of recovery-time measurements, and trust us, this is the only description out there that explains how to do this critical measurement. Try it and impress your friends and boss! 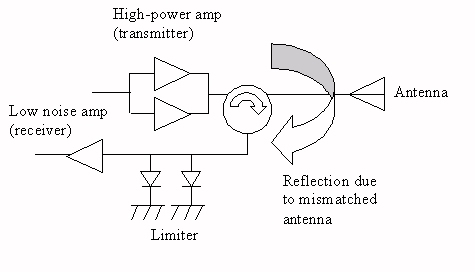 A radar system typically duplexes a transmit and receive signal through one antenna, as shown in the figure below. When the transmitter is on, some amount of power will reflect off of the antenna and leak into the receiver, putting it into large signal operation (perhaps even saturation). This does some funny things to the receiver, most notably, it can kill the small-signal gain for competing signals. When the transmit signal is turned off it takes some time for the receiver to recover to it's cheerful, high-gain self. Hence, the term "recovery time". In order to measure recovery time, you will need two signal sources, one providing a pulsed high-power signal (with rise/fall time better than the recovery time you want to measure), and one providing a CW lower-power signal. They must be separated substantially in frequency (a few GHz should do it), but both be within the bandwidth of the device under test. You will need a bandpass filter that passes the small CW signal, and rejects the large signal by 50 dB or more (hence why they need to be separated in frequency). We recommend a waveguide filter for this. The filter is the "trick" that allows you to examine the detected waveform of the small signal at the output of the DUT, without blowing up your lab equipment: typically 23 dBm will blow an expensive detector diode. Suppose you want to measure the recovery time of an X-band limiter (bandwidth 8-12 GHz perhaps), after it is hit with a ten watt pulse. The recovery time specification you need to beat is 50 nanoseconds. The two signals you want to apply to your DUT are a ten-watt pulsed signal with less than 10 ns rise time, and a 10 dBm CW signal (close to the threshold power where the limiter starts to limit). 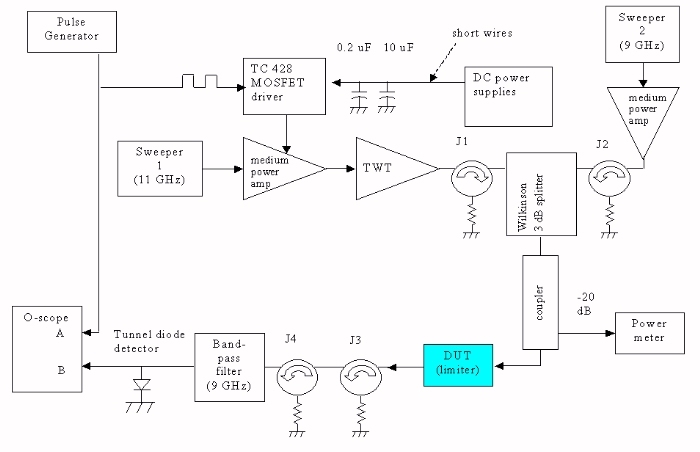 In the figure below, sweeper 1 supplies a 11 GHz CW signal to the medium-power amplifier. Here we have chosen to drain-pulse this amplifier and use it as the modulator for the high-power signal, to create a nice sharp square-wave RF pulse. Why did we do this? Because the sweepers you will find in your lab usually are not capable of fast rise times. The drain-modulated amplifier supplies a one-mW square-wave pulsed signal with less than 10 Ns rise/fall time to the TWT, which creates the 10 Watt pulsed signal to DUT. Note that charge storage is important for the drain-modulated amplifier (the 10 uF and 5000 pF caps), as well as having short leads (low inductance) to the power supply. Sweeper 2 and the second medium power amplifier supply the weak CW signal to the DUT (~10 dBm CW). Don't be tempted to combine the two signals earlier and amplify them through the same high-power amplifier (the TWT) because you may well end up measuring the recovery time of the amplifier instead of the DUT. The bandpass filter after the DUT essentially removes the strong pulsed signal from the output of the DUT. It is rejected by ~50 dB (if your filter is any good! ), and is reflected back toward the source, and dissipated in the two isolators J3 and J4. This allows the best possible view of the recovery time on the scope because no attenuation is needed in front of the detector to protect it from the strong signal. Just be sure some fool doesn't mess with the frequency of the strong signal and put it inside the filter passband, which will cost you a detector for sure!!! Barrier diode detectors from Krytar have 1-2 nanoseconds rise time when terminated with 50 ohms. The 20 dB coupler and power meter in the set-up are used to calibrate the detector output voltage. Remember that since you are using a square-wave, the peak power is three dB higher than the average power reading. Coherent versus non-coherent RF pulses--what does this mean?